A new report by NBC raises questions about a former Marine’s claims that she was denied a tip while waiting on a family at a restaurant due to her sexual orientation. Former Lance Cpl. Dayna Morales, a restaurant server, posted a copy of this receipt to Facebook. She said the customer wouldn’t tip her because she was gay, but a new report from NBC calls her claim into question. The image sparked outrage on social media sites and other websites like BuzzFeed. Morales later told NBC she had received money from supporters who wanted to provide her with the tip the customer didn’t leave. She said she was donating a portion of the money — about $3,000 — to the Wounded Warrior Project. Her boss told NBC people were traveling to the New Jersey restaurant just to meet Morales. They were requesting to be seated in her section, he said. Now a couple stepped forward to claim they were her customers at the restaurant that day. They told NBC that they did leave a tip, and provided a copy of their credit card reflecting the charges. 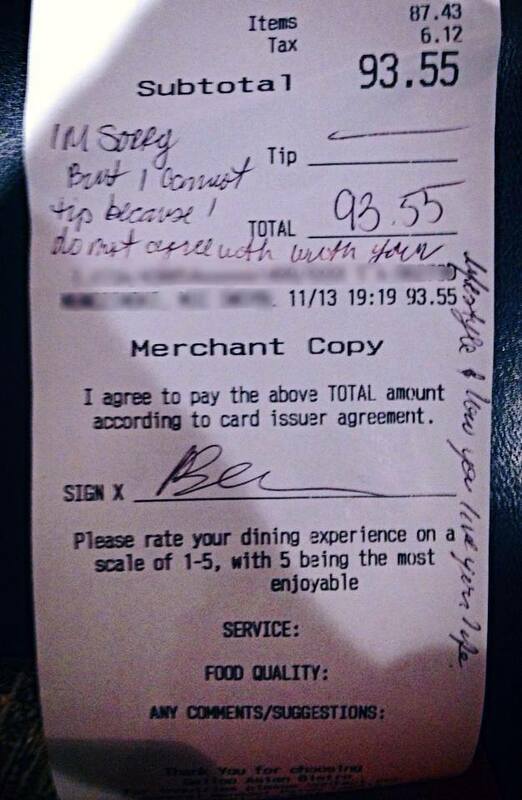 They requested to remain anonymous, but said they didn’t leave any anti-gay note on the receipt. They told NBC they believe their receipts were doctored. The restaurant later released a statement to NBC, which said they were aware of the allegations and had no comment pending an internal investigation. Morales told NBC she’s sticking with her story and is certain she wasn’t tipped. She also confirmed that she would donate the money received to wounded warriors. Very easy to write on their receipt after, not so easy for Ms. Morales to doctor the original. I believe her! I’ll back LCpl Morales. More often than not it’s people “such as this “woman”” who never receive justice or equality. I just wish you were donating to your local grassroots VSO instead of the so called non-profit profiteers. This article explains her history lying and attention seeking – http://dailycaller.com/2013/11/27/new-jersey-hate-receipt-waitress-liar-say-friends/ … Anyone who still believes her at this point is naive or in denial. proof is on the credit card statement……. Im a Marine myself, and believe me, I understand backing each other up. But not when you’ve got ONE being deceitful. The couple was cer cooperative and showed their receipt & they’re credit card statement. I’ve worked in restaurants before, actually for a very long time. I know FOR A FACT that Morales had the opportunity to print out another receipt and write whatever she wanted on it. However, the couple DOES NOT have that option. Morales and the dumb manager are not being cooperative and won’t show the receipt. So…. Who’s lying? She’ was looking for attention & pitty…. How pathetic! Good thing she’s out of the Corps now, what a poor excuse! Integrity violator! I am a Marine and this is pathetic. First off a Marine has no friends on Duty. Simply put if you are doing wrong you are not my friend nor are you upholding what takes or what it means to be a Marine. she had the ability to print another receipt, but the couple didn’t, their receipt clearly shows that Morales lied and falsified the document, and has since been fired for her deceit, sad to see a marine do this, very embarrassing to the Corp. everybody so quick to jump on couple for anti gay crap, but not so quick to dig for the facts. and i don’t think wounded warriors want money from someone like this. Who cares? People can tip or not tip for any reason. What does it say about a Marine who has such thin skin that she has to draw attention to the fact that someone doesn’t like her lifestyle? So much for mental discipline. So much for being able to take criticism. Why should she care that someone disagrees with her lifestyle. As a Marine she was sworn to protect all Americans, even the ones who disagreed with her lifestyle. I want to see her record and I wonder why she got out as a LCpl. this couple had both the receipt AND a credit card statement. This “marine” needs to get what’sd coming to her. She didn’t “get out”, she was chronic UA. She was a reservist, so all that happened was a admin separation. She’s a liar and deserves all of the negative attention she desperately grabbed at. Yep F R, she was a chronic UA and eventually, after a tremendous amount of work by the chain of command, she got the boot. Yea, kicking an obligore reservist out ain’t friggin’ easy. And yepper to Kim as well. To date, the Wounded Warriors have received exactly jackshit out the thousands she got. Welcome to internet hell, Morales. Feeling the burn yet?